Saturday May 21st 1881 I got up very early and sewed some before breakfast and went over town early for some buttons I needed about my dresses. I sewed all day and finished my work and helped Mother some on a pair of pants she was making for Father. 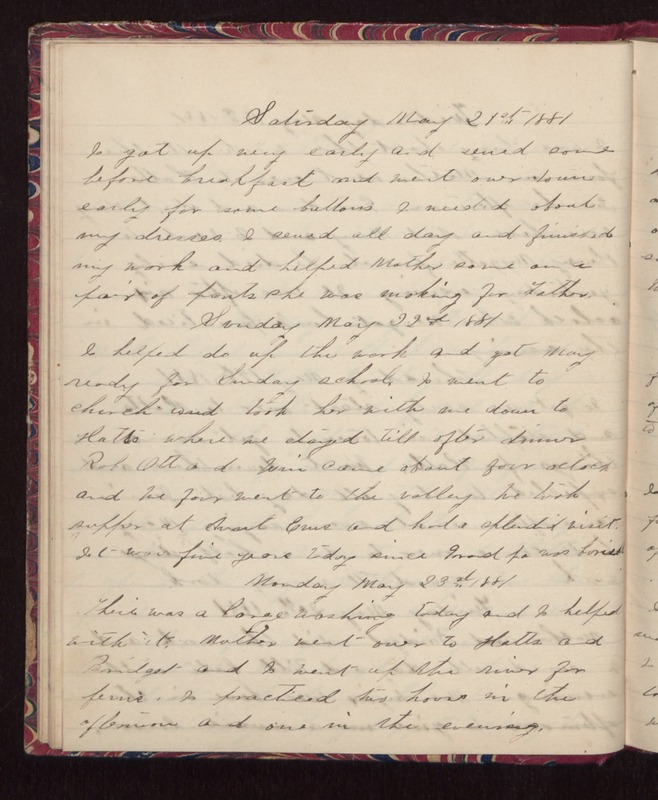 Sunday May 22nd 1881 I helped do up the work and got May ready for Sunday school. I went to church and took her with me down to Hatts where we stayed till after dinner. Rob, Ott, and Win came about four oclock and we four went to the valley. We took supper at Aunt Ems and had a splendid visit. It was five years today since Grandpa was buried. Monday May 23rd 1881 There was a large washing today and I helped with it. Mother went over to Hatts and Bridget and I went up the river for ferns. I practiced two hours in the afternoon and one in the evening.